Angela also made the view A using cotton and trimming it with a band in a contrasting color. I have to be honest, I think her skirt is just gorgeous. At the time she sent me pics of her skirt I was sewing my own view A using denim and I was so inspired by Angela's idea that I added a satin ribbon trim to my skirt. 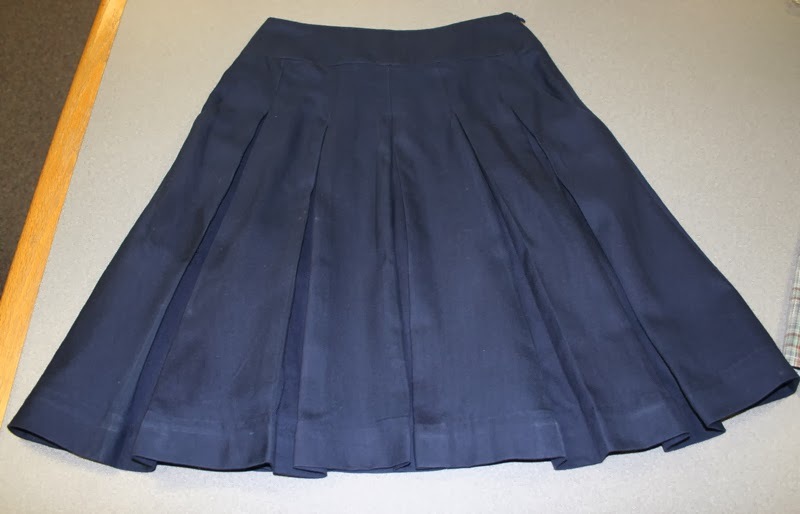 Angela says the sewing was rather intense and she needed to concentrate on the work, but with the instructions and a sewalong guides an advanced beginner would be able to make the skirt on his / her own. I was thrilled by Angela's commitment to the testing - she noted every single typo in the instructions that I missed. Also, she was very detailed in her comments, suggestions, sending ideas on how to rephrase a certain sentence to make it more clear and understandable. Her comments were very helpful when I was correcting all the steps in the instructions that were not clear enough. If you ever need a pattern tester, I recommend Angela :). Visit her blog Sewn By Angela. Julijana also made the view A. She decorated the skirt with embroidery stitches along the belt loops, pockets and hemline. I like how her skirt combines a classic style with the casual one. The skirt's made of denim, but you can't say it's too informal. Claire made a cheerful and colorful skirt using the View B. She used a curtain cotton as the main fabric and the red gabardine for the border and waist yokes. She also shortened the skirt by several inches. 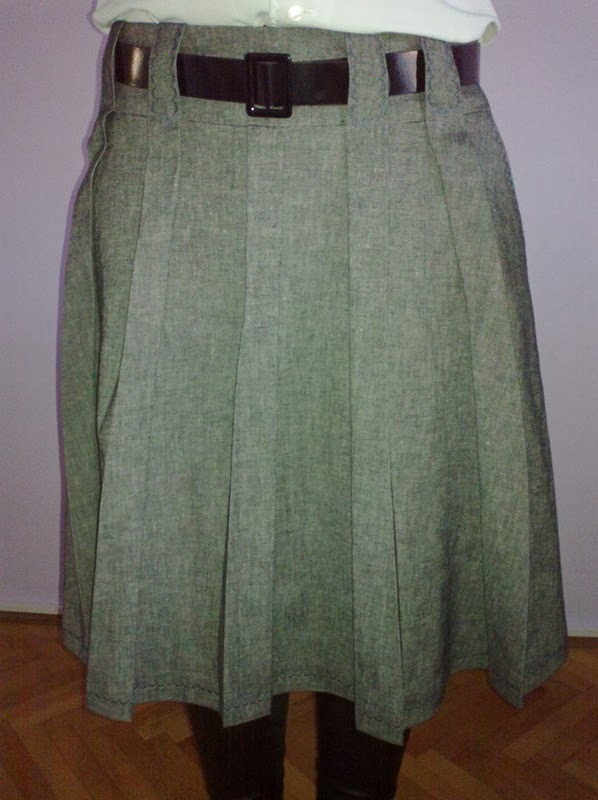 I really like her version - it's such a nice skirt for spring! When I completed sewing my skirts I thought having three skirts made with the same pattern was enough, but after seeing Claire's variation I thought of making another similar to hers - cheerful and casual, that would match well with a pair of flats and summer blouses. 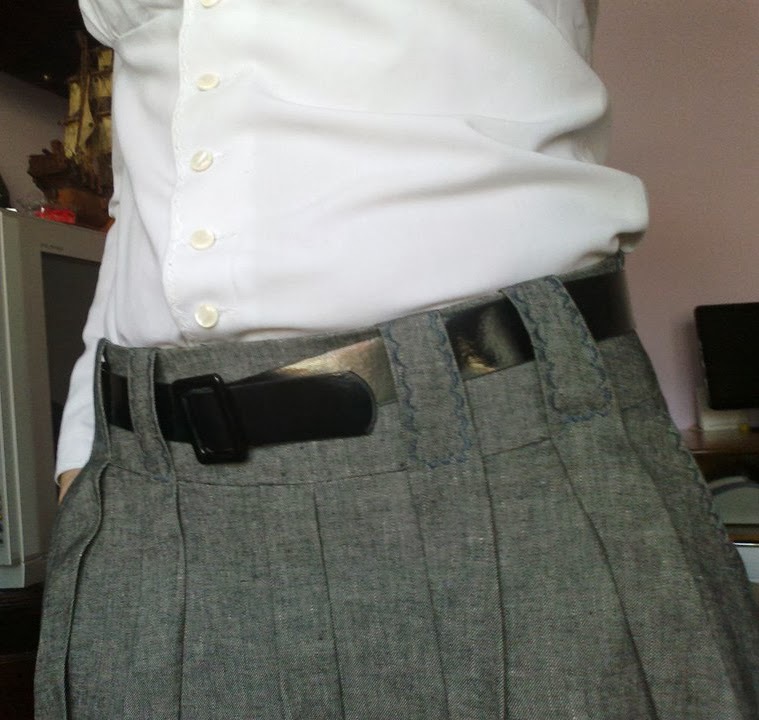 Read more about her skirt and testing experience on Claire's blog Ragbags and Gladrags. Kathy made not one but two skirts while testing the pattern! They're both made using the View C pattern, but in different fabrics - one's made of navy cotton, and the other in a plaid fabric. I have to point out Kathy is a very experienced seamstress and she made a clever alteration to the pattern in order to adapt it for working with plaids. 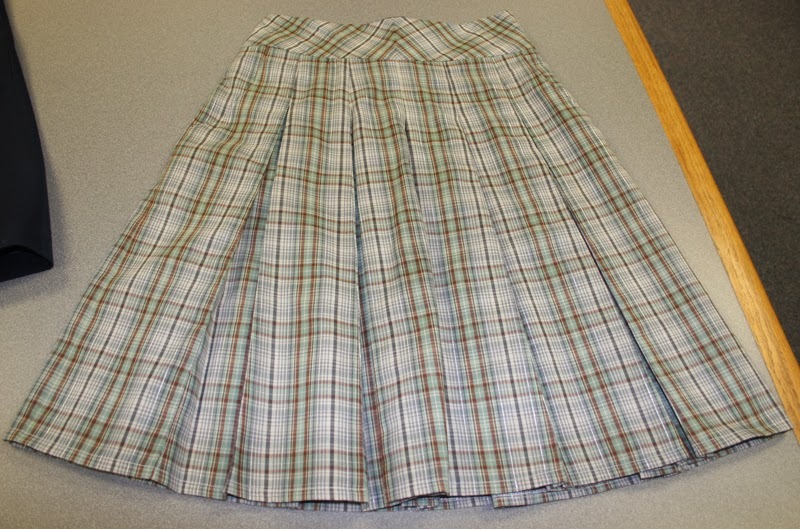 You see, the Zlata skirt pattern is not appropriate for plaid and striped fabrics in it's original state (I'll write more on that next week), but a certain alteration can solve this problem. Kathy made an alteration perfectly and I will show you what she did to the pattern in one of the following posts, so stay tuned! Also, I'd like to thank Kathy for checking out all my measurements conversion from metric system to yards and inches. To make this more specific, Kathy did that while she was waiting for her husband while he was having a surgery! Luckily, Kathy's husband's surgery went well and he is recovering. Ana ,divno je sto si uspela da svoje krojeve plasiras na trziste preko Etsy.Mogla bi da pustis jedan koristan post o tom placanju,registarciji i svemu potrebnom,sto si ti inace prosla kako bi mi ostali dosli do korisnih informacija. Cale, to je odlican predlog, i gledacu da napisem post cim prodje promocija kroja. Inace, i sama navijam za to da sto vise ljudi pokrene prodaju ka inostranstvu, jer sam ubedjena da je tamo pravo trziste, a ne kod nas. I love the version of the pattern with the belt loops. It looks genius! AnaJan, I love seeing all the different versions that have been sewn up by all the other testers, and I'm looking forward to reading more about them on any that have blogs. Thank you so very much for your lovely and kind write-up in this post. It was a real pleasure to test this pattern and I love my new skirt. When I blog and review it, I will come back and post a link.